Designed at Centro Stile in Turin, Italy, the 2017 Fiat 124 Spider borrows cues from the original Spider – widely considered one of Fiat’s most beautiful cars of all time – and reinterprets them for today. The 2017 124 Spider has a timeless low-slung presence, with a classically beautiful bodyside, well-balanced proportions and a sporty cabin-to-hood ratio. Features like the hexagonal upper grille and grille pattern, “power domes” on the front hood and sharp horizontal rear lamps call to mind details of the historic Spider. The car is available with a six-speed manual transmission or a six-speed automatic transmission and a 1.4-liter MultiAir Turbo four-cylinder engine that delivers 160 horsepower and 184 lb.-ft. of torque. The suspension uses a double-wishbone layout in front and a multi-link in the rear, specifically tuned for greater stability while braking and turning. Steering is light and responsive with the use of an electric power assist system. The interior is crafted and designed to focus on the occupants, with premium soft-touch materials throughout. Ergonomics were applied to emphasize the driving experience and ensure easy operation of the steering wheel, pedals and shifter while driving. 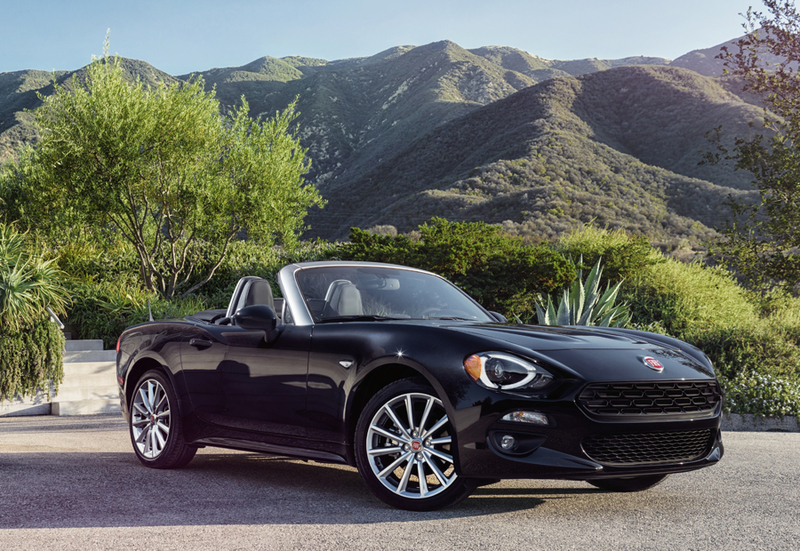 For an open-air driving experience, the Fiat 124 Spider’s soft convertible top is easy to operate and requires minimal force, much like the original Spider’s top. The 2017 Fiat 124 Spider is available in two trim levels: Classica and Lusso. Each model is available in six exterior paint colors, including Rosso Passione (Red Clear Coat), Bianco Gelato (White Clear Coat), Nero Cinema (Jet Black Metallic), Grigio Argento (Gray Metallic), Grigio Moda (Dark Gray Metallic) and Bronzo Magnetico (Bronze Metallic). The Lusso (“Luxury”) model is also available in tri-coat Bianco Perla (Crystal White Pearl). To celebrate the return of the classic nameplate, the first 124 vehicles will be offered as a limited-edition Prima Edizione Lusso. Each will be individually numbered with a commemorative badge and available in exclusive Azzurro Italia (Blue) exterior paint with premium leather seats in Saddle. Owners who purchase a Prima Edizione will also receive limited-edition items, including wearables and a poster. Tweet us @mochamanstyle or leave a comment on our Facebook Page to share your thoughts on this article. Subscribe to Mocha Man Style on Feedio for updates in your inbox.